Beijing (AP) — China announced it will hold live-fire military exercises in the Taiwan Strait amid heightened tensions over increased American support for Taiwan’s government. The announcement coincided with President Xi Jinping speaking on the importance of Chinese naval power while attending a massive fleet review Thursday in the South China Sea off the coast of Hainan province. State media said the fleet review included 48 ships, among them China’s sole operating aircraft carrier, the Liaoning, along with 76 helicopters, fighter jets and bombers, and more than 10,000 personnel, making it the largest since the founding of the People’s Republic of China in 1949. 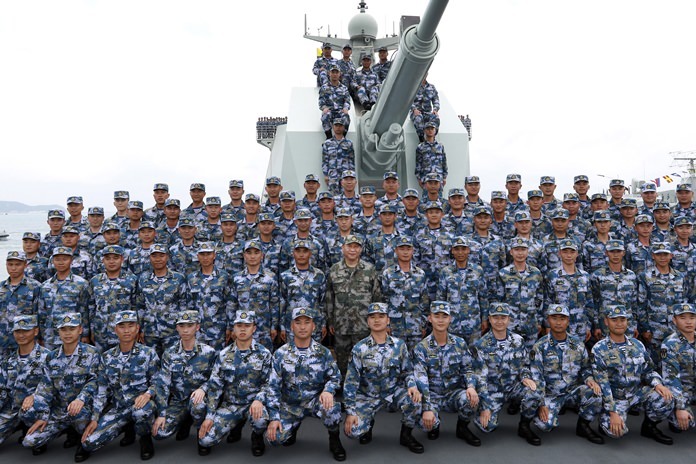 The navy began three days of exercises off Hainan on Wednesday, but ended them a day early on Thursday, the provincial maritime safety administration said. No explanation was given for the curtailment of the drills or the Taiwan Strait exercise, and the Defense Ministry did not immediately respond to questions. The maritime safety authority in the coastal province of Fujian said the one-day Taiwan Strait drill will be held next Wednesday. Taiwan’s defense ministry responded with a statement saying the exercises appeared to be part of scheduled annual drills, and that they were closely monitoring the situation and fully capable of responding. “Citizens please feel at ease,” the statement said. While Beijing responded mildly to President Donald Trump’s early outreach to Taiwan’s independence-leaning government, recent developments have prompted a tougher response. China claims Taiwan as its own territory and says the sides, which separated during the Chinese civil war in 1949, must eventually be united, by force if necessary. Chinese officials have denounced the recent passage of a U.S. law encouraging more high-level contacts with Taiwan. China says the Taiwan Travel Act violates U.S. commitments not to restore formal exchanges severed when Washington switched diplomatic recognition from Taipei to Beijing in 1979. An agreement to provide Taiwan with submarine manufacturing technology and the appointment of hawkish National Security Adviser John Bolton have also hardened views among anti-American nationalists in China. Beijing’s Taiwan Affairs Office on Wednesday warned against additional moves to strengthen relations with Taiwan. Last month, President Xi delivered a strongly nationalistic speech in which he vowed to protect “every inch” of China’s territory. “All acts and tricks to split the motherland are doomed to failure and will be condemned by the people and punished by history!” Xi said. China has also stepped up air force missions around Taiwan and has repeatedly sailed the Liaoning through the 160-kilometer (100-mile) -wide Taiwan Strait. The just-completed naval drills off Hainan underscored China’s growing capabilities in defending its maritime interests and territorial claims, particularly in the South China Sea, which it claims virtually in its entirety. An estimated $5 trillion in global trade passes through the waterway annually, and China has constructed airstrips and other installations on artificial islands to enlarge its military footprint. The drills near Hainan follow recent ones in the sea that featured the Liaoning, amid deployments and drills by the rival U.S. Navy. China is building new vessels at a rapid pace to equip its navy, coast guard and maritime law enforcement agencies, including its first entirely domestically built aircraft carrier. Hainan is home to a major military presence, including naval air stations and the country’s largest submarine base. This week it also hosted a global business forum that included a smattering of world leaders, among them Philippine President Rodrigo Duterte, whose country is a U.S. treaty ally and has overlapping claims with Beijing in the South China Sea.